One of my boxes has Windows 10 installed in a drive where it coexists with Slackware 64-current, which is installed in a different partition. Over the last weekend, I was able to update Windows 10 to the recent anniversary update. Despite some disturbing reports on the press, the update went smoothly and without incidents. Screenshot of Windows 10 Anniversary Update. Note some significant improvements: the notification box moved at the far right of the panel, the Edge Web Browser, and, most notably, the Ubuntu instance running Bash. The Edge browser got the ability to use extensions. Edge was a great browser, but the lack of anything even moderately resembling AdBlock Plus was a real showstopper to me. (Not that I am opposed to ads, but some sites are not only annoying, but downright abusive with their advertising.) After this update, Edge gained the ability to use extensions. Right now there are just a few, but the good thing is that AdBlock Plus is one of those precious few. Now, if only they could get something like Flashblock or Flashcontrol, I would be really happy; but AdBlock does indeed make a real difference. Using Edge is now bearable and I can begin to give it a spin. Even so, not all is great in Edge land; The browser feels reasonably fast and snappy most of the time, but it still chokes on some sites. Loading TweetDeck is possible, but it is excruciatingly slow. Typing a tweet in TweetDeck under Edge is a real test of one’s patience. Meanwhile, very heavy TweetDeck setups (with 20 or more columns) feel snappy and responsive on both Chrome and Firefox. Therefore, Edge is a nice browser but still has plenty of room for improvement. 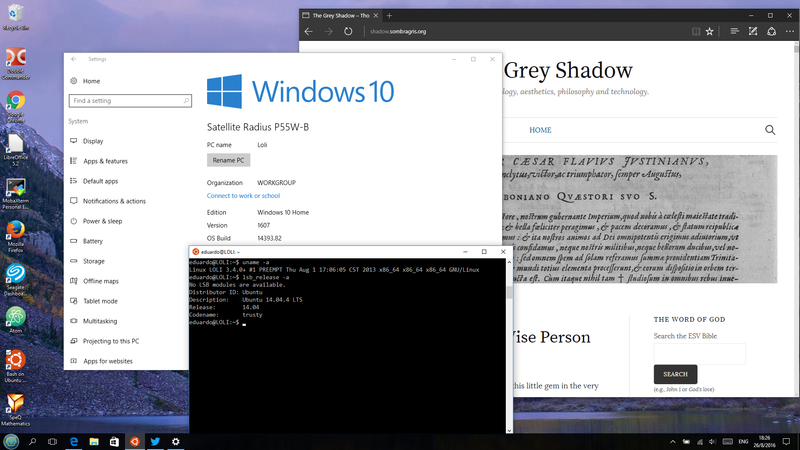 Now it’s possible to have a real Ubuntu Linux instance on Windows, so you can run Bash and a lot of other Linux programs natively. If you are adventurous enough, you can even manage to run the Unity desktop on top of Windows 10, but it’s not a smooth ride at all. But you can run a lot of console-based applications and utilities and that is a godsend. However, in addition to these new features and additions there are some problems. I will refer to two of them. The Windows 10 Twitter app became unstable and began to randomly crash. I experienced some crashes especially after posting and quoting tweets. But the most serious issue, a real showstopper, is that plugging a Kindle e-reader can bring the whole system down with a Blue Screen of Death (see screenshot in the Guardian article; I experienced the very same thing). Just plug a Kindle over any USB connector and pop! goes the system. So, in conclusion: there are some definite improvements. Edge finally can be considered as a first call Web broswer, and the Ubuntu subsystem is a most welcome addition. Take into account that my Windows setup resides on a partition in the same drive than Slackware and that there were some reports of Windows deleting Linux partitions. Despite the fact that I have my Windows coexisting with GNU/Linux on the same drive, I did not experience any of these problems and my Linux partitions were not touched. However, on the other hand, this update brought new levels of unstability that were unheard of in the previous Windows 10 version. In my particular case, as a Kindle user, the crashing was, and still is, extremely serious and unresolved by any update. Therefore, my advice is to hold this update until the serious bugs are fixed. Meanwhile, try to stay with the previous Windows 10 version, which was much better in terms of stability. And, Redmond folks: please get your act together with the Kindle issue! Update 06/09/2016: After two cumulative updates, it appears that the Kindle issue has been fixed. Overall, the system feels more stable so I can now recommend existing Windows 10 users to proceed with the upgrade.